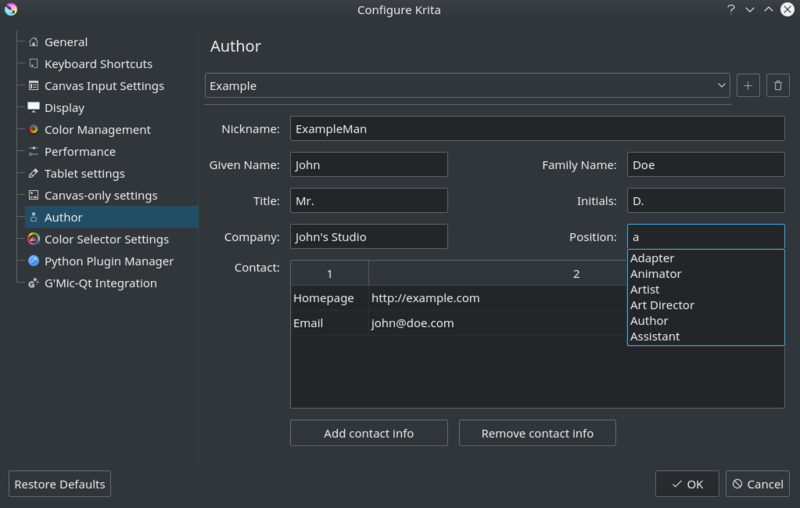 Krita allows creating an author profile that you can use to store contact info into your images. The main element is the author page. This page was overhauled massively in 4.0. By default, it will use the “Anonymous” profile, which contains nothing. To create a new profile, press the “+” button, and write up a name for the author profile. You can then fill out the fields. In older versions of Krita there could only be one of each contact info. In 4.0, you can make as many contact entries as you’d like. Press Add Contact Info to add an entry in the box. By default it will set the type to homepage, because that is the one that causes the least spam. Double homepage to change the contact type. Double the “New Contact Info” text to turn it into a line edit to change the value. New in version 4.0: The jpeg and png export both have Sign with author data options. Toggling these will store the Nickname and the first entry in the contact info into the metadata of png or jpeg. For the above example in the screenshot, that would result in: ExampleMan (http://example.com) being stored in the metadata.